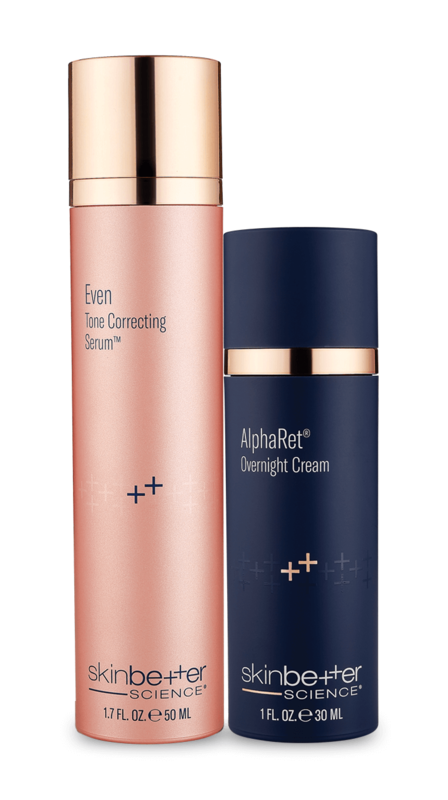 Achieve amplified improvement in the appearance of skin discoloration by pairing AlphaRet Overnight Cream with Even Tone Correcting Serum. AlphaRet is the latest innovation in retinoid renewal delivering remarkable results, with little-to-no irritation compared to other retinoids and retinoid-based products. Provides moisture to help counteract dryness associated with traditional retinoid-based products. A potent blend of antioxidants helps neutralize free radicals. * Twice-daily application of Even Tone Correcting Serum and evening application of AlphaRet Overnight Cream. Unretouched clinical photography. Data on file, skinbetter science. Individual results may vary. Amplify results with AlphaRet Overnight Cream. Can be used in combination with Even Tone Correcting Serum for more amplified results. Oxygen Infusion Wash: Aqua/Water, Sodium C14-16 Olefin Sulfonate, Glycerin, Methyl Perfluorobutyl Ether, Cocamidopropyl Betaine, Sodium Cocoamphoacetate, Methyl Perfluoroisobutyl Ether, Hydroxypropyl Starch Phosphate, Sodium Acrylate/Sodium Acryloyldimethyl Taurate Copolymer, Pentylene Glycol, Ethoxydiglycol, Glycolic Acid, Lactic Acid, Salicylic Acid, Malic Acid, Bisabolol, Hydrolyzed Jojoba Esters, Tocopheryl Acetate, Tocopherol, Ethyl Macadamiate, Cocamidopropyl Hydroxysultaine, Xanthan Gum, Propanediol, Ethylhexylglycerin, 1,2-Hexanediol, Decylene Glycol, Sodium Chloride, Citric Acid, Sodium Magnesium Silicate, Phenoxyethanol, Sodium Benzoate. Even Tone Correcting Serum: Aqua/Water, C13-15 Alkane, Propanediol, Caprylic/Capric Triglyceride, Glyceryl Stearate Citrate, Linoleic Acid, Glycerin, Dimethicone, Alpha-Arbutin, Arginine PCA, Hydrolyzed Sodium Hyaluronate, Bisabolol, Cetearyl Alcohol, Acetyl Glycyl Beta-Alanine, Hexylresorcinol, Terminalia Ferdinandiana Fruit Extract, Artemisia Capillaris Flower Extract, Diglucosyl Gallic Acid, Pancratium Maritimum Extract, Ceramide NG, Linolenic Acid, Beta-Glucan, Algin, Tocopherol, Butylene Glycol, Ethylhexylglycerin, Xanthan Gum, Carbomer, Sodium Phytate, Sodium Hydroxide, Phenoxyethanol, Benzoic Acid, Sorbic Acid, Citric Acid. AlphaRet Overnight Cream: Aqua/Water, Sodium Glycolate, Glycolic Acid, Cetearyl Olivate, Pentylene Glycol, Cyclopentasiloxane, Isohexadecane, Sorbitan Olivate, Tetrahexyldecyl Ascorbate, Glycerin, Ceresin, Glycol Palmitate, Butylene Glycol, Niacinamide, Squalane, Methyl Gluceth-20, Ethyl Lactyl Retinoate, Palmitoyl Tripeptide-1, Palmitoyl Tetrapeptide-7, Ceramide NP, Hyaluronic Acid, Ubiquinone, Tocopherol, Bisabolol, Tocopheryl Acetate, Superoxide Dismutase, Butyrospermum Parkii (Shea) Butter, Allantoin Glycyrrhetinic Acid, Sodium PCA, Panthenol, Camellia Sinensis Leaf Extract, Portulaca Oleracea Extract, Linoleic Acid, Cholesterol, Linolenic Acid, Magnesium Aluminum Silicate, Dimethyl Isosorbide, Dimethicone, Glyceryl Stearate, PEG-100 Stearate, Steareth-2, Hydroxyethylcellulose, Acacia Senegal Gum, Xanthan Gum, Hydrated Silica, Carbomer, Polysorbate 20, Tromethamine, Disodium EDTA, Ethylhexylglycerin, Phenoxyethanol, Titanium Dioxide (CI 77891).